Occasional indigestion may be the result of several factors, including a lack of hydrochloric acid (HCl), known as low stomach acid. Natural supplementation with HCl, along with plant-derived enzymes and soothing herbs, may help relieve occasional indigestion, heartburn & sour stomach. 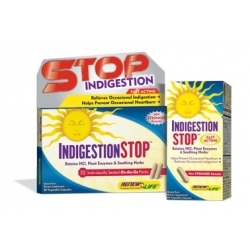 Indigestion STOP is a powerful digestive enzyme blend with HCl and soothing herbs formulated to enhance digestion and nutrient absorption. Plant-derived enzymes and betaine HCl help digest proteins, carbohydrates, fats and vegetable fiber, and meadowsweet has natural antacid properties that soothe and protect the lining of the digestive tract. Ginger, gentian and peppermint help ease feelings of nausea, stomach discomfort and prevent occasional gas and bloating.